"When you've got them by the balls, their hearts and minds will follow." Land of the Blind desperately wants to be a movie of ideas. That ambition alone is rare and welcome enough to commend the effort of writer and first-time feature director (and former Airborne Ranger) Robert Edwards. Unfortunately, while there is a good deal of style here, the ideas onscreen aren�t as original or nearly as clever, one suspects, as Edwards believes they are. Land takes place sometime around now, but in a surreal, almost comic-book inspired fictional nation with elements of Augusto Pinochet's Chile, Franco's Spain, and, most boldly, pre-revolutionary France. Donald Sutherland is Thorne, an articulate and sympathetic prisoner of conscience under the fascist regime led by Maximilian II. Ralph Fiennes is a guard and soldier who comes to form an ideological bond with his charge. From the simple premise there is an interesting turn when it becomes clear that even humble scholar Thorne may not be immune to the corrupting influence of power. In the first segment Edwards uses some really wild visual touches along with pretty broad satire, but the two leads, among the most reliable actors of their respective generations, keep the proceedings anchored nicely. It never hurts to cast Donald Sutherland as a bad guy, as he's never been an actor to telegraph wickedness. Lara Flynn Boyle is on hand as well, but is more or less wasted as the film's Lady MacBeth in just a few short scenes. There's an energy early on, a directorial gustiness, and some really lovely camerawork that are admirable. No subtlety is on display, nor is any really intended. The mix of genres and styles, though, is distancing. It�s visually interesting to imagine a nation of modern, television-obsessed Americans under a Mussollini-looking leader with powdered-wig-headed retainers, but none of it quite meshes into a cohesive world. It just never feels complete or quite whole. Despite the best efforts of a couple of great actors, there never came a point where I really cared about these people or their country. By about the mid-way point, the outcome seems clear and the movie has made its point, and frustratingly it's also around this time that everything becomes extremely important. The speeches become grander, the pronouncements more intense�suddenly, everything is to be taken very, very seriously. It's a bit of a bore, really, and I could have forgiven Land everything but this. Ultimately, the movie's fatal flaw lies in its inability to stretch a couple of neat ideas to feature length. At an hour, this could have worked�there just wasn�t a full movie here. I'll be interested to see what director Edwards comes up with in the future. I'd bet there's a good flick in him, but Land isn't really it. Image Transfer Review: The transfer here works well, and that's a very good thing. The film has a lot of contrast and a broad color palette, and a washed out transfer could have killed some nice visuals. There's no obvious grain or haloing�very nice job. Audio Transfer Review: The audio transfer also works pretty well, although it's not a knockout. There's a lot of dialogue (and speechifying, for that matter), so there aren't a lot of scenes that would really serve to show off the full speaker range. In some of the scenes between Fiennes as guard and Sutherland in his prison cell, the soundtrack makes good use of the surround to create a feeling of depth; a nice touch. Extras Review: There's not much here. We get the movie�s theatrical trailer along with the ten-minute making of, Anatomy of a Thriller: Behind the Scenes. It�s a few talking heads and some production footage. It does provide a bit of insight into director Edward�s intentions, though only fleetingly. 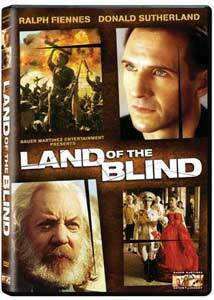 Land of the Blind starts out with some guts and quickly loses steam, going on long after its point has been made. It's pretty frustrating, but it might (emphasis on might) be worth checking out just to get a taste of that early energy. There's an amateur chef at work here, gleefully throwing his favorite ingredients into a pot. The finished dish is overcooked, and a bit of a mush, but for a time it's a blast to share his enthusiasm.